Invierna is Spanish for Winter. 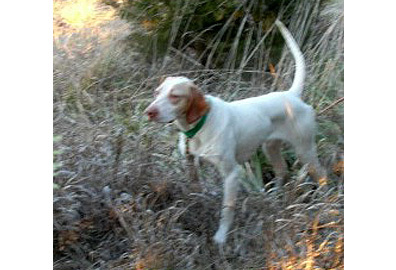 “Winter” is a white and orange beauty with a choke bore nose. She placed as a Derby in 2013 and demonstrated precocious bird finding abilities last summer on her first trip to the prairies. Plans are to run Winter sparingly in shooting dog stakes and then to consider breeding her to a quality All Age stud. She is a full sister to All Age sensation Greypointe Izquierda (called back at the National Amateur Chicken Championship at Mortlach, Saskatchewan), major circuit AA Derby SF Strongwind (winner of the John S. Gates Derby Classic at Broomhill, Manitoba) and All Age Derby winner Greypointe Islamorada, who also had an All Age win as a Derby last season. Winter marks the fifth generation of our unbroken Greypointe female line to win in trials and to be selected for our breeding program. She has a near freakish ability to go straight across big alfalfa fields in North Dakota and nail feeding sharptails in the early morning dew. This is the same kind of nose her mother and grandmother both possessed and what our kennel is grounded in – bird finding ability. “Gypsy” is littermate to Tango and won as a puppy prior to assuming her role as personal hunting dog and mother. Gypsy was run this spring in one shooting dog stake taking first place in Iowa. We are evaluating and planning for a breeding this winter for a spring whelping date. She is a dog that I frequently show off when hunting wild birds all over the country – just as I did with her mother, Shutup 'N Kissme. Greypointe Gloriosa - Whelped 2/3/06. 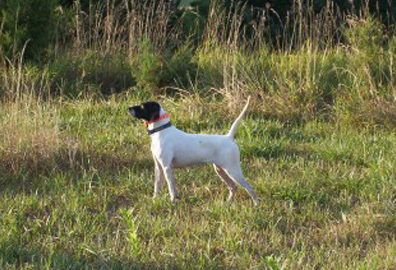 "Glory" is an attractively built white and orange Derby who placed this spring in a Derby stake while still a puppy. She has an outstranding nose and is rapidly learning how to find wild birds. She will be trialed sparingly this year as we continue to add to her field/hunting experiences on chicken, pheasant, Huns and quail. We are expecting great things from her.